Hotel Modern Est is located in Paris, a short walk to Gare de l’Est and Gare du Nord. It offers free Internet access. Hotel Modern Est features 20 rooms with a private bathroom and a flat-screen TV with satellite channels and Canal+. 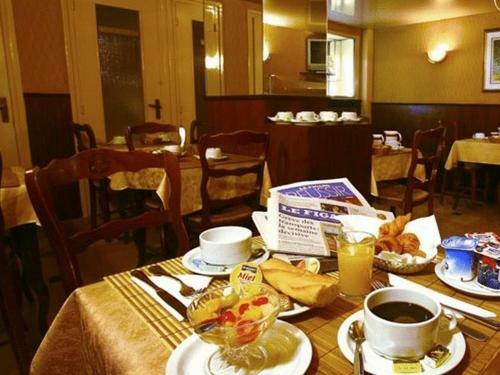 The hotel is close to 2 railway stations including the international station of Gare du Nord. It is close to Charles de Gaulle Airport and to several metro stations that offer access to central Paris. This room has a TV, a minibar and a private bathroom with a bath. Rate: € 84.17 ... € 115.00; select dates below to get current rates. This room has a TV, a minibar and a private bathroom with a shower. Rate: € 55.00 ... € 115.00; select dates below to get current rates. Rate: € 65.00 ... € 115.00; select dates below to get current rates.